I love Christmas books all year round. I start listening to Christmas music in September whenever the mood strikes. It's great nesting, baking, crafting music. Christmas novels just make me feel like snuggling under a warm blanket and relaxing. If it's cold enough for a blanket, it's close enough to Christmas for a good story. Maybe it's a bit early for you, but be on the lookout for some good books to read with your family this year. We add a new picture book every year. My kids at home are 14, 16, and 18. Last year they unanimously agreed to continue this tradition. That's what makes a tradition — the desire to keep it! Have yourself a merry little Christmas a little early this year! I agree with you. Christmas stories are cozy and warm. But I'm a little bit of a Scrooge when it comes to Christmas. I enjoy it, but only in very small doses. I can't do the "year round" thing. So I save my Christmas stories to read only between Thanksgiving and Christmas. I have found that it helps get me in the Christmas spirit so I'm not so bah-humbug-ish. LOL! Laura, you are SO like me...ha I just love Christmas and the cool weather gets me ready for it. My husband laughs at me, because I get so anxious to see Christmas movies /books. I think I watch , It's A Wonderful Life about 4-5 times during the season..One of my favorite movies..
Have fun cuddling under the warm blankets and enjoy the books. I will have to check at the library for some of those books.. thanks for sharing. Enjoy your Christmas reading and baking and all that good stuff. Hi Laura. A tradition I miss from my children's youth. 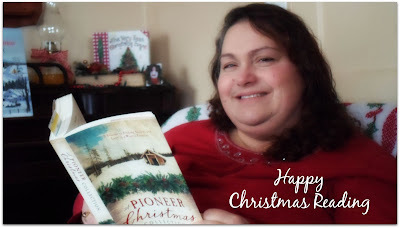 I'm adding a link back to this post from my Christmas blog,Susie's Christmas Cottage@ blogspot.com. One of my children's favorites was Christmas at the Tomten's Farm. I completely understand, Karla. I just find they give me a little boost to get in the gift making spirit, too. I also have way too many to read in December alone. ~smile~ To each her own. I'll be over to your blog for a visit in a few minutes. Blessings to you! What can I say Linda? I love it all! Laura, What a lovely tradition! Even at 55, I love children's picture books! I crawl into the pictures. I am so excited to now have a precious granddaughter who is six months old, and although we are reading and "eating" books, lol, I look forward to many, many quiet moments with her reading books. Thanks for sharing your book list! I still love children's books! I use to buy a new one each year as well. I have a few on your list. Don't buy one every year anymore, just if I happen to find one that I can't leave behind. We still buy a new game every year though. Thanks for sharing with SYC. Do you have Apples to Apples Jann? My kids enjoy it. I'd like to buy Balderdash.